Israeli soldiers invaded, Monday, Khirbat Um Neer village, east of Yatta town, in the southern West Bank governorate of Hebron, and demolished a water well. Rateb Jabour, the coordinator of the Popular Committee against the Annexation Wall and Colonies in southern Hebron, said the soldiers demolished the well, allegedly for being dug without a permit. He added that the Palestinian who owned the well, identified as Farid Ahmad Jabour, used it to collect rain water for his home and farmland, amidst frequent water shortages in the area. Jabour also said that the well is near the illegal Israeli Susya colony, which was built on private Palestinian lands, and stated that the army and the colonists carry out frequent violations against the villagers, their homes and lands, to force them to leave. In related news, illegal Israeli colonists installed several mobile homes on Palestinian lands, in the southeastern area of Kufur Qaddoum town, east of Qalqilia, in northern West Bank. 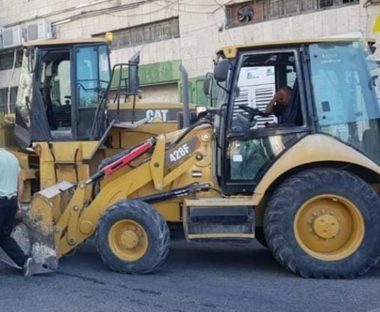 The colonists installed the homes near Kedumim illegal colony, while dozens of soldiers were deployed in the area, and on roads between Qalqilia and Nablus.